Hong Hua Pte Ltd had plans in place for its subsidiary, Mata Thai, a casual dining restaurant in the Bishan neighborhood heartlands. The plans include introducing an e-ordering system through the use of an iPad, as well as expansion to shopping malls over the next 5 years. It is without doubt that mature workers would find picking up new technology a huge obstacle. In addition, underlying issues such as communication barriers between multi-generational staff as well as the difference in expectations between superior and worker would have to be managed. 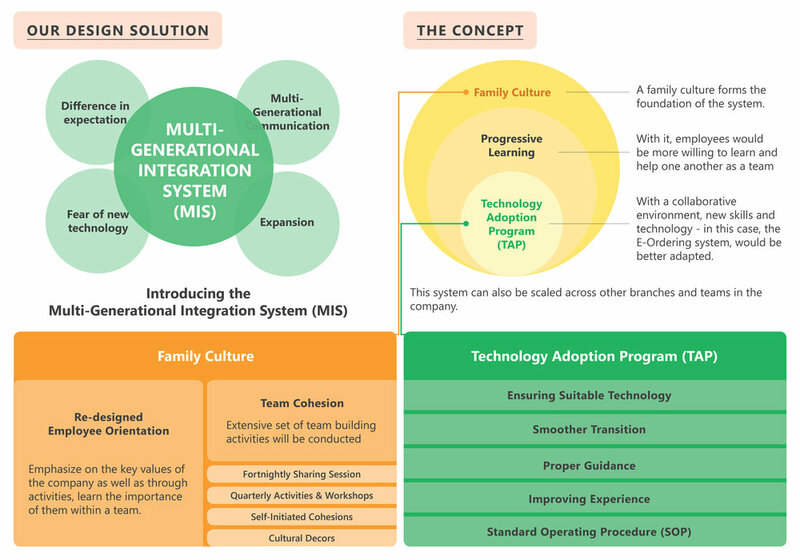 By re-creating a collaborative environment that encourages progressive learning, the Multi-Generational Integration System (MIS) aims to promote the adoption of new skills in the workplace (ie. iPad e-ordering system).